So you just got an Instant Pot and can’t wait to use it to cook up some quick and easy delicious meals. There’s one problem: that pressure release valve can be a bit scary at first, and you don’t want to get hit with super hot steam as you try and get to your food! Don’t worry, we’re going to show you how to safely release the pressure from the valve in this guide. Check and make sure that the silicone sealing ring is properly seated around the ring rack. If it’s properly seated, you should be able to rotate it with some effort. Take a look at the float valve and anti-block shield. The shield can be taken off to be cleaned after use, but you want to make sure that it’s back in place afterwards. Both the float valve and anti-block shield should be clean and free of debris. Make sure that the pressure release valve is in place, and it is set to the Sealing position (upwards). If all of these are properly in place, your Instant Pot should be able to build pressure and cook your food. When everything is under pressure, the floating pin of your Instant Pot should be in the “up” position. For those who have the Instant Pot Ultra model, it automatically seals for you so you don’t have to manually do it yourself. Once you hear your Instant Pot beeping because the food is done, you can choose to release the pressure immediately (Quick Release) or let it sit for a bit before releasing (Natural Pressure Release). When you’re ready to release, grab the handle of the pressure release valve and turn it downwards to the Venting position. It’s highly recommended to use something, such as a wooden spoon or the rice paddle that comes with your Instant Pot, to turn the knob in order to prevent your fingers from getting hit with steam. If you cook something with a lot of liquid or starch, like soups and pastas, you’ll want to release the pressure in controlled bursts (slowly and carefully, a few seconds at a time). Otherwise, you’ll end up with a mess all over your kitchen if you just let it all spew out. Also make sure that your Instant Pot is not directly underneath kitchen cabinets, as steam hitting the cabinets may cause unwanted warping of wood and create a breeding ground for bacteria. Once all of the pressure is released from the valve, the pin should go down (give it a tap if there’s no more steam coming out but it’s still up), and you can safely open up the Instant Pot. Releasing the pressure when cooking with an Instant Pot can be a bit scary at first, but you get used to it once you start using it more. Just make sure to never touch the handle of the pressure release knob directly, as hot steam and liquid coming out may burn you. Always use something to turn the knob (that’s why it’s fairly loose and wobbly when on), divert the steam away from cabinets, and also release in controlled bursts (release a few seconds at a time) for lots of liquid or starch. Our guide applies to most Instant Pot models, including the Lux, Duo, Duo Plus, Nova, Viva, Smart Bluetooth, Smart Wi-Fi, Ultra, and Max. Certain higher-end models, like the Ultra, automatically seal on their own, so you don’t need to manually adjust the knob to the Sealing position. The rice paddle that I always use and is pictured in this guide comes as an accessory bundled with your Instant Pot. However, if you don’t have it, then any wooden spoon or kitchen utensil with a bit of a reach will do. 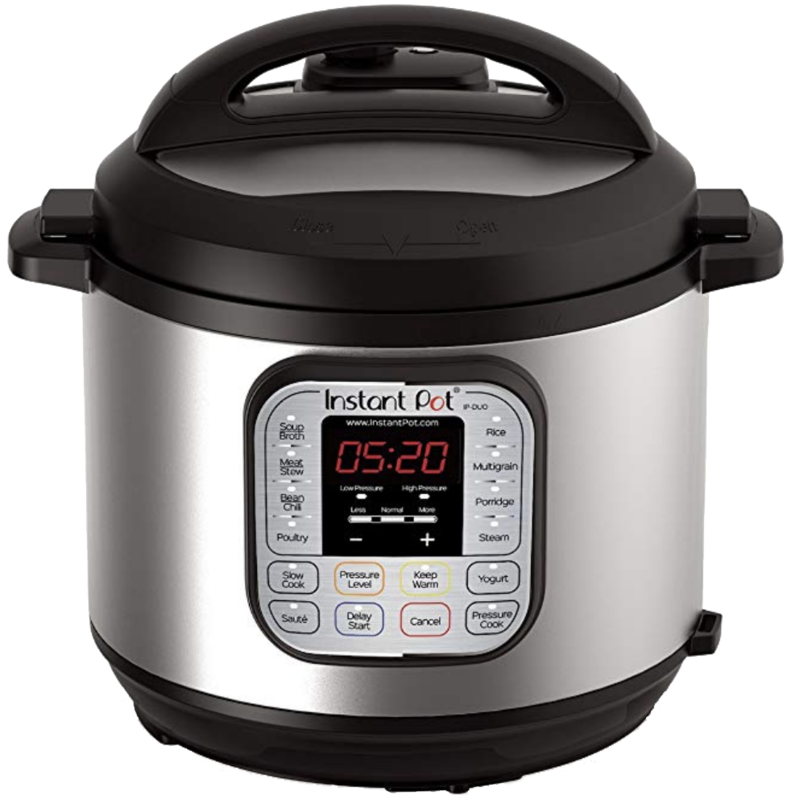 The DUO80 is the largest size of Instant Pot’s most popular model, the Duo. With this large version, you’ll have plenty of room to cook pretty much anything, and you won’t have to worry about it being too full or ingredients not fitting. Remember, you can always cook less in a big pot, but you can’t cook more in a smaller pot, so the DUO80 is great for feeding large families or even two people with a lot of leftovers. If you don’t want the biggest size, or simply don’t have space for it, then here are some other options. The DUO60 is the most popular Instant Pot. With a 6-quart size, it’s big enough to feed 3-4 people comfortably, and there should be plenty of leftovers. It also replaces seven kitchen appliances in one.